In June of 2005 AGS Laboratories adopted a cut grading system that emphasized a "Light Performance" grade. In January of 2006, GIA released their historic cut grading system for round brilliant cuts. The objective of both of these cut grading systems was and is to help the consumer get the most beautiful diamond they can for their money. We have completed an extensive study of both cut grading systems, along with how they correlate to the available optical technologies, as well as "practical observation" of the diamond. This knowledge has enabled us to hand select diamonds with the finest craftsmanship and the highest light performance attainable within the diamond shape the customer requests. Generally speaking, Old Mine Cut diamonds were very poorly cut, off round, and had sloppy symmetry and proportions that lent themselves to preserving the most weight possible from the rough. In the early 20th century, before the advent of electricity, these diamonds were cut by candle light and exhibited a very blocky pattern of faceting. Tall crowns, extremely deep (which made them face up smaller), wide faceting, and a very large culet which can look like a hole in the middle of the diamond. The image to your right is of a genuine antique Old Mine Brilliant cut. Note the blocky faceting, the small table and the extra large culet facet in the center. With the introduction of the American Ideal Cut round brilliant in the late 19th century these OMBs eventually took a back seat as the cutting style of rounds changed the market forever. Old Mine Cut and Old European Cut diamonds are generally only found in pawn shops, antique shops, and stores that specialize in antique and vintage jewelry. 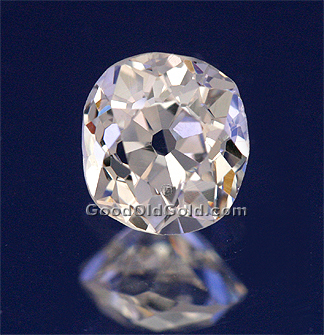 Today the modern round brilliant cut still stands as the diamond that is #1 in demand. Since the late 1990s, we have witnessed a growing demand for cushion cuts, in particular vintage styled cushion cuts. Around that same time, we began hand selecting diamonds for our clients based on optics, light performance, and the best cut qualities attainable within their desired shape. Only a couple of cutting facilities around the world still cut the vintage styled cushions that originated so long ago. That fact makes this style of cushion the hardest to find amongst the world of cushion cuts. Like most cutting facilities however this small handful of vintage cushion cutters continue to maintain the most weight from the rough to make them as cost effective as possible. However, cutting with this philosophy produces diamonds with optics that are less than ideal and optical symmetry that is poor. As clients requested them, we would acquire these vintage styled cushions and perform a series of optical examinations on them to inspect them for their brightness, contrast, fire and sparkle. 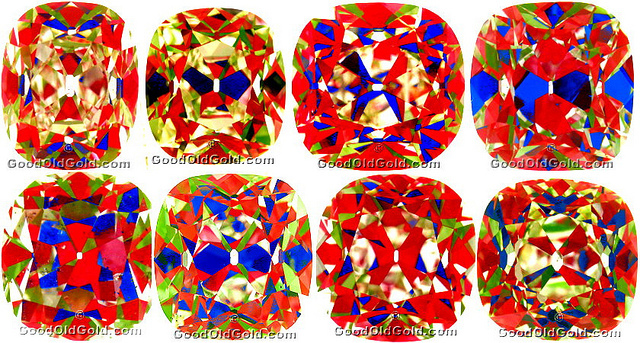 Figure C shows a small sampling of ASET images that were typical of what we see as we would call these diamonds in for analysis. Note that every single one of these ASET images features either lots of blatant white (light leakage) or dark blue bands (head/body shadow) under the table facet. 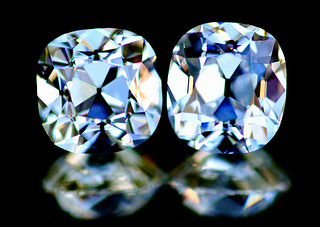 Extraneous light leakage or dark blue under the table in an ASET analysis produces unseemly visual artifacts when viewing diamonds in natural lighting. We want to see as much red as possible, especially in the table facet. v Have perfect or near perfect Optical Symmetry. v Eliminate the blatant leakage under the table facet. v Eliminate the excessive head and body shadows. v Cut it to optimize the best possible light return. We worked with a skilled cutter to determine the precise combination of angles that would produce the perfect saturation of reds (light reflection) via the ASET technology and in the summer of 2009 Good Old Gold introduced the August Vintage® Cushion! The goal of this product was to produce precise optical symmetry combined with the best light performance attainable in the vintage cushion facet design. Figure E shows a sampling of August Vintage Cushion ASETs and the consistency to which this new brand would be cut. Note that each ASET image shows a strong predominant saturation of reds under the table facet combined with red, green, and blue contrast extending from the table down to the edges and girdle. Every single August Vintage Cushion is cut to consistently have top optical performance, guaranteeing our clients the most beautiful vintage styled cushions available. After perfecting the cut we submitted the August Vintage Cushion to AGS Laboratories and on June 9th, 2010 AGS Laboratories deemed August Vintage Cushions to officially have "Ideal" Light Performance making them the first vintage cushions in the world to attain such status. video shows a second characteristic about these cuts: the size (the actual real estate on the finger) for the weight. Usually, when you cut a diamond to maximize its weight, it will generally result in a diamond that looks smaller for its weight. 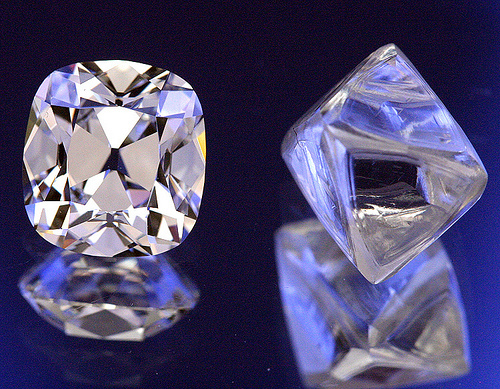 Here is an example of two round diamonds, both of which weigh 1.01ct. The diamond on the left is a commonly cut round brilliant while the diamond on the right is a precision cut Hearts & Arrows. 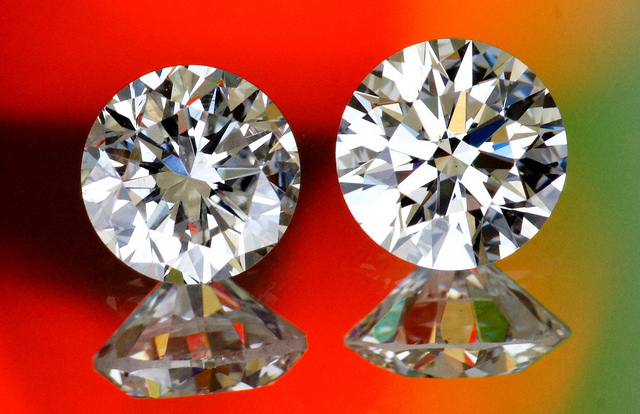 The diamond on the left was cut to maximize the weight while the diamond on the right was cut to maximize the optics. The natural result is not only a brighter more fiery diamond (and consequently more beautiful diamond) but also a bigger circumference. 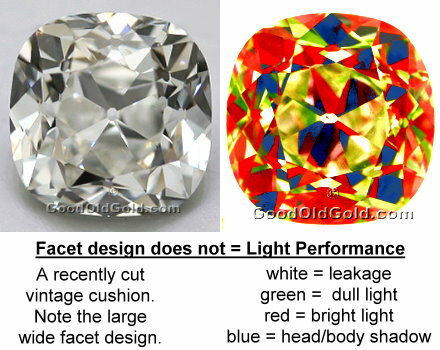 The circumference of the diamond on the left (had it been cut properly) is equivalent to a .89ct diamond although it weighs 1.01ct. We see these same results with the August Vintage Cushions. 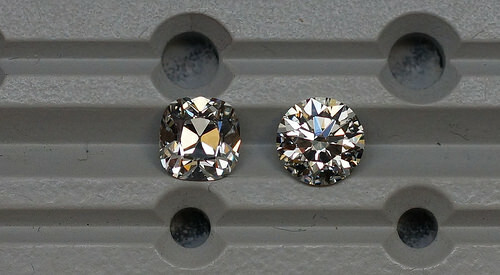 Below is an example of one a generic vintage cushions, a 2.01ct, alongside an August Vintage Cushion weighing 2.05ct. The weight difference is only .04ct, but note the difference in size. The August Vintage Cushion (on the right) appears considerably larger. For reference, Figure G shows a 1.02ct August Vintage Cushion next to a 1.02ct Hearts & Arrows round. Rounds generally look substantially larger than cushion cuts. This is not the case with the August Vintage Cushion though. As you can see, the August Vintage Cushion looks larger than the round. Why are August Vintage Cushions more expensive than generic cushion cuts? Ever since diamonds have been cut, scenario #1 has dominated our trade as there have generally not been standards by which to cut diamonds. There have only been basic facet designs with no particular attention to proportions or overall geometry. That is, until the late 1800s with the invention of the "American Ideal" by Henry Morse, which was later refined by Marcel Tolkowsky in 1919. This is still the standard for all ideal cut rounds today. These men sought to improve and refine diamond optics within the round brilliant cut and make their products more visibly beautiful than the norm. However, not many cutters or jewelers accepted or understood the idea, with the exception of Tiffany who made Tolkowsky's research their staple.  Cutting ideal rounds took more time, increasing labor costs, and meant losing more material (up to 25% more) during the cutting process. WHAT DO THESE TWO IMAGES RELATE TO? With little information available about cut quality and light performance in diamonds, the trade was more inclined to cut the largest least expensive products available. This cutting philosophy dominates the trade to this day. In fact, a web search for 1.00-1.01ct G VS2 and GIA "Excellent" cuts will yield results with variances in pricing of as much as 30%, even in diamonds on the same website. In the late 1990s and early 2000s with the introduction of new and innovative optical technologies that allow us to critically study light leakage and light return, a handful of gemologists revisited this idea of cutting diamonds for high optics thinking along the lines of their predecessors (Morse and Tolkowsky). It was with these optical technologies (ASET, FireScope, Isee2, BrillianceScope, Octonus Ray Trace, and AGS Performance Grading Software) that the August Vintage® line was designed and created. 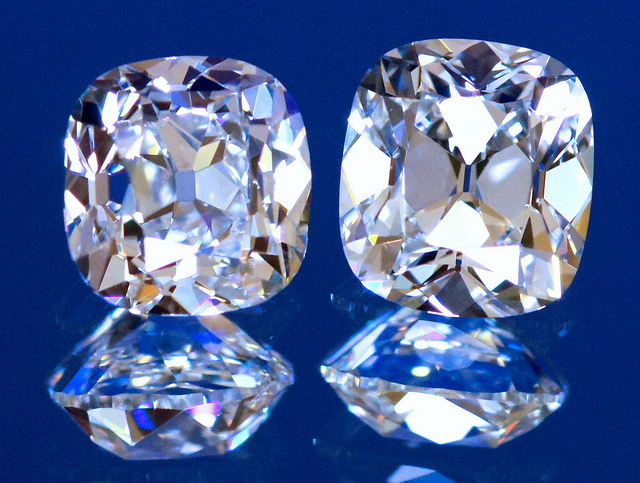 Like ideal cut rounds, August Vintage® Cushions and August Vintage® Old European Cuts are cut to the highest standards in the industry and are the only vintage diamonds to attain the coveted AGS "Ideal" designation for cut and light performance. How often do you cut more August Vintage Cushions? As often as we need them. We generally stock an inventory of August Vintage Cushions ranging from 1/2ct to 3ct sizes in both white and warm varieties. Our primary goals is to be able to offer our clients a selection of August Vintage® Cushions at price points ranging from around $1000 to $100,000. Did you actually invent the "Ideal vintage cut cushion" or did you just invent the name "August Vintage"? We invented the ideal vintage cushion cut and branded it August Vintage® Cushion. Although AGS owns the term "Ideal Cut" within the industry, the August Vintage Cushion was optically designed around their definition of the term and our experience working with optical technologies including AGS' own Angular Spectrum Evaluation Tool (ASET). In fact, our August Vintage® diamonds are certified AGS Ideal Cut. The name "August Vintage" was developed in corroboration with members from our online community. We knew we wanted to incorporate the word "vintage" into the name and a forum member, "Ellen," suggested the word "august" which means "inspiring awe or admiration, majestic." This word, coupled with "vintage" which is defined as "characterized by excellence, maturity, and enduring appeal; classic." Why do you stock K, L, M, N and lower colors? Because they are just as beautiful as their whiter counterparts and come in at great price points! Originally we had no intention of cutting August Vintage diamonds below J color but after we began cutting we had many inquiries for colors in that range. My curiosity got the better of me and we cut a business of August Vintage® Cushions ranging from K-O colors. When we saw how beautiful and how popular they were, we have since stocked a regular inventory of both "white" and "warm" August Vintage® Cushions. The pastels observed in ambient lighting blend beautifully with the warmer tones and the chemistry is simply amazing. The beauty of a diamond lies in its cut quality (its ability to effectively and efficiently grab and reflect light). There is a large body of people who love and appreciate the beauty and price points of these warmer colors. In fact, it’s hard to think of a K color August Vintage as "yellow" because their superior optics cause them to face up so white. The August Vintage Cushion in Figure H happens to be an M color (photo courtesy of Natalia Milianku). Can I have an August Vintage custom cut? If so, what is the process? Yes you sure can.  When cutting diamonds from the rough it is important for you to understand how the process works and the flexibility we need from you when we are doing this.  When a business of rough is purchased, the diamonds will generally be categorized into parcels of estimated color and clarity grades. 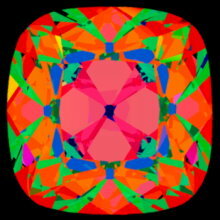 For example if we purchase a parcel of 10 diamonds we may purchase them, for example, at G VS2 pricing. 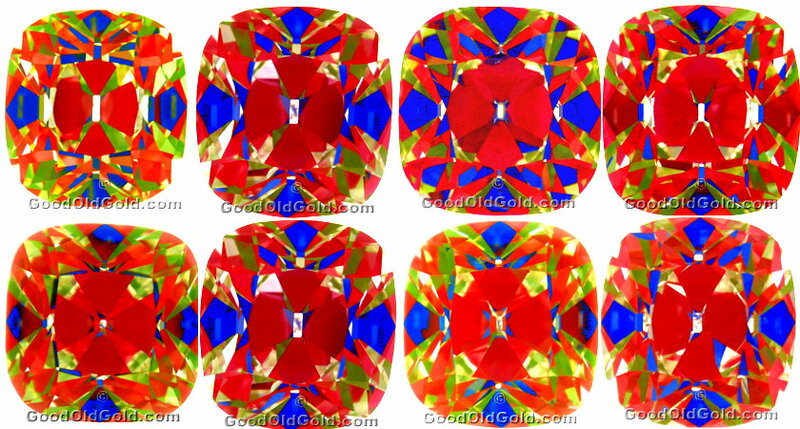 Of the 10 diamonds, after they are cut and submitted to the lab for grading, the diamonds may be graded F VS, F SI, G VS1, H VS2, G VS2, H SI1, etc. It is very possible and highly likely that not all the diamonds are going to get exactly the G VS2 pricing I paid for. However when you average the cost of the lot, it generally works out fair for what was paid. So in essence, if you would like an August Vintage® custom cut for you, we need a certain degree of flexibility, generally within 3 grades of color and clarity. The same would hold true if we were purchasing a single larger diamond. Due to the fact that clarity and color grading are subjective to a degree, we need flexibility from our clients. For the details check out our page on "Custom Cutting" here. I'm comparing another retailer’s G VS2 (not an August Vintage) with your August Vintage which has a lower color and clarity. They are comparably priced. Why should I buy yours instead of theirs? Isn't theirs the better buy? Not necessarily, when you consider the significance and longevity of a diamond purchase. The average person cannot see the difference between a G and an H color. Many people would be hard pressed to see the difference between a G and an I color. Color, and clarity when not detectable by the naked eye, is something we would consider an “intangible.” The cut quality however is something that can be visibly seen and is a "tangible" that is well worth sacrificing the “intangible” for. 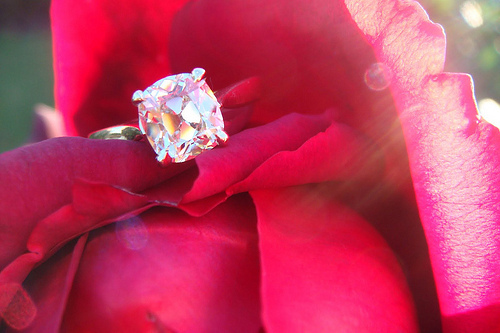 Remember that cut quality dictates the beauty of the diamond. Color and clarity (as long as it's not undesirably yellow or has large eye visible inclusions) will always take a back seat to cut quality. To read about others who have chosen cut quality over price here is a thread on an Internet forum created exclusively for August Vintage Cushion lovers. 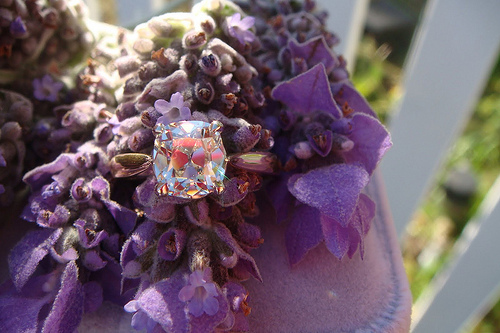 Click here to view our August Vintage Cushion diamond inventory.